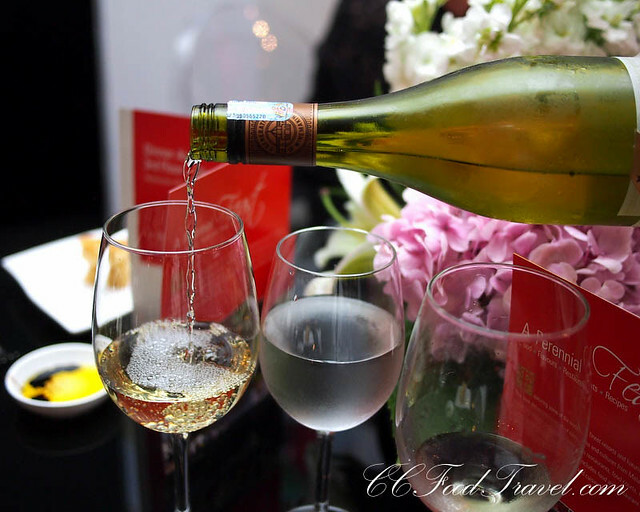 Witnessing the launch of A Perennial Feast By YTL Hotels.. When asked about the title of the book, author Kim Inglis said that she chose the word because, ‘enduring’ about sums up the idea behind the book and the culinary journey she wished to take us on. 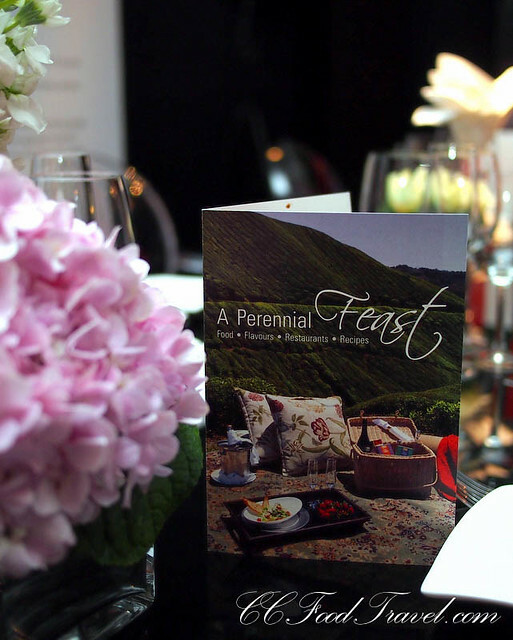 Just last week, YTL Hotels, invited us to witness the unveiled of its much anticipated coffee table book, A Perennial Feast, at Starhill Culinary Studio, Starhill Gallery, Kuala Lumpur. 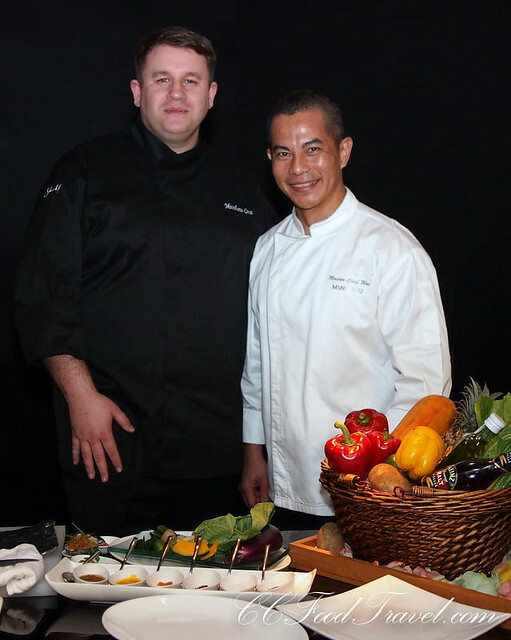 Located on the Muse floor of Starhill Gallery, Starhill Culinary Studio is a sleek and beautifully designed space, with state-of-the-art kitchens, demonstration rooms and a private dining room. Its reason for being is analogous to that of a muse – a true source of inspiration. Great Chefs from a extensive array of culinary backgrounds can be observed cooking through live cooking demonstrations, hands-on cooking classes, bespoke themed private dinners and events, and team building sessions, stimulating a fervour for cooking with finesse and flare. 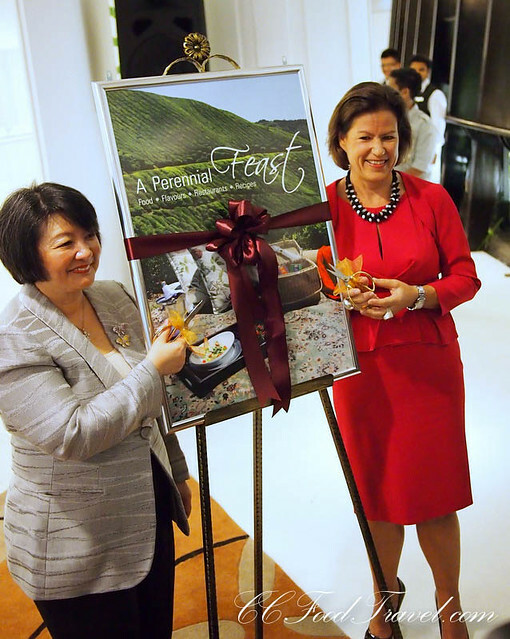 I thought that presenting the Perennial Feast, that had the beautiful cover featuring Cameron Highlands tea plantation as backdrop, as a gift to all the attendees at the launch, was a nice touch. It now sits on my coffee table at home. The book was launched in grand YTL fashion by Dato’ Yeoh Soo Min, Executive Director of YTL Corporation at Muse level, Starhill Gallery KL. 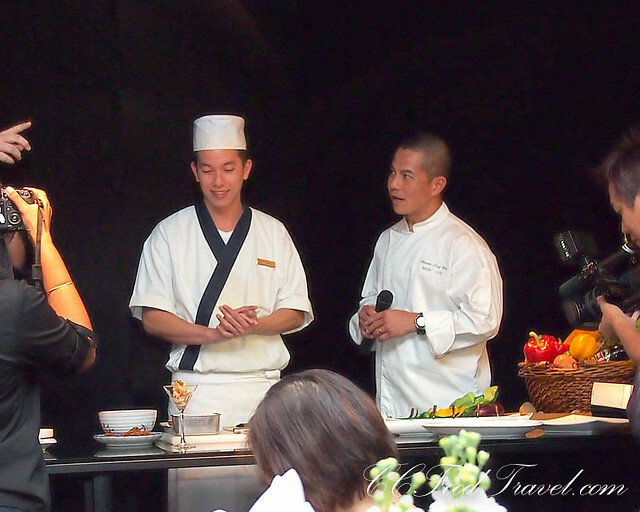 When Kim introduced the book, she spoke of a lovely culinary journey that spanned the globe and covered a variety of cuisines and cultures from Malaysia and Southeast Asia into China, Japan to Europe, all the while featuring some of the world’s finest resorts and luxurious destinations from YTL Hotels. Beginning in Malaysia this book would take you on a journey that covered both island resorts and city heritage hotels and restaurants, the highlight being recipes of traditional Malay fare that are combined with some East meets West fusion food and some innovative seafood dishes. Flipping the pages, you will be soon transported further afield into a snowy landscapes of Hokkaido and the cityscape of modern Shanghai, exploring both recipes and cuisines from Japan and China. It will be hard to put this book down, as you continue your gastronomic adventure through England, Bali, Thailand and France.. and as if great writing is not enough, vivid illustrations in stunning full color photography by Danish photographer, Jacob Termansen will make cities, landscapes and cuisine come alive and stimulate your appetite and desire to travel even more! 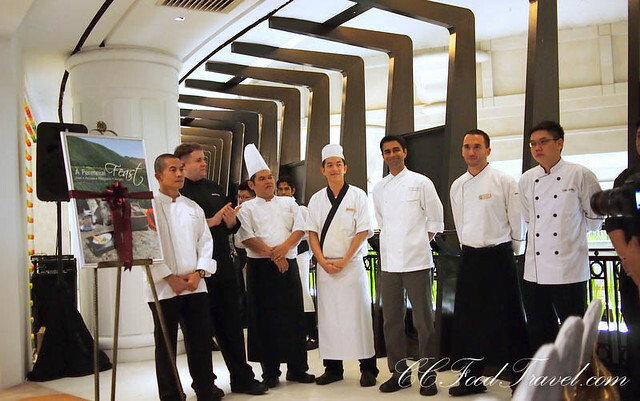 After the launch we were ushered into JW Marriott for a four course dinner, prepared at the private third floor gallery. The entire room had been transformed and slinky, black drapes hung from the high ceiling. Two long tables took center stage and were decorated tastefully with gorgeous wild flowers. I liked the designer inspired dining table and chairs – a classy touch I must say. The prawns were huge and fresh. I thought that the sauce was a little overpowering and somewhat distracting. 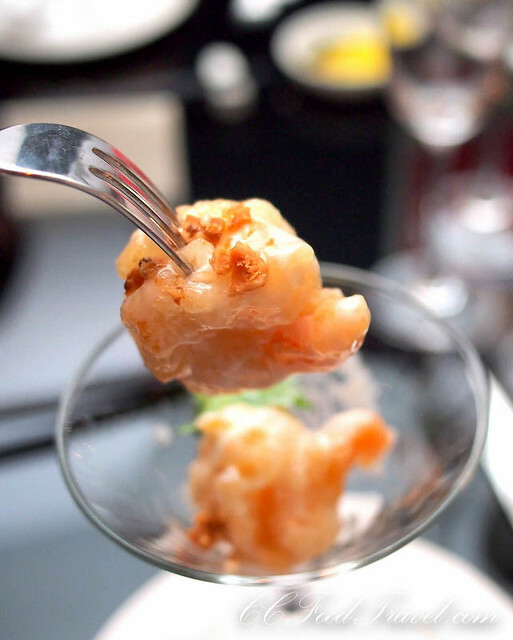 When I eat seafood, I like to fully experience the flavors of the food itself, not just a whole load of sauce. Loved the soft shell crab maki – no complaints here. 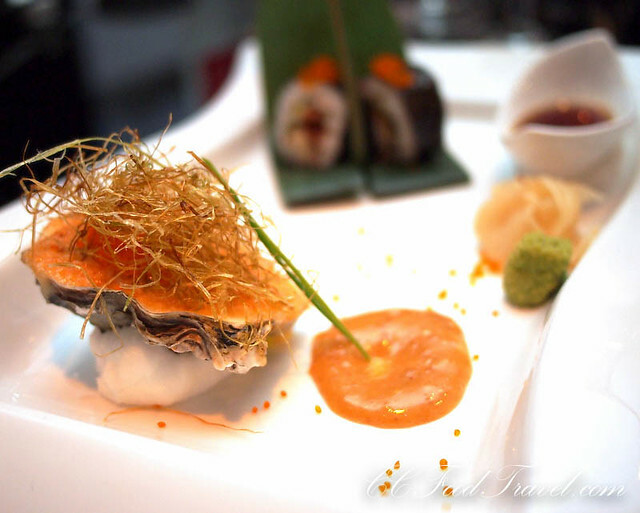 The kaki Agebonoyaki was in fact oysters cooked in their shells with kewpie mayonnaise, mentaiko and sugar. In Japanese, “Kaki” means oyster and “agebonoyaki” is a type of grilling that includes the shell. The oysters were tasty, but again, a little heavy on the sweet mayo sauce – not my cup of tea. Next our main course was served. 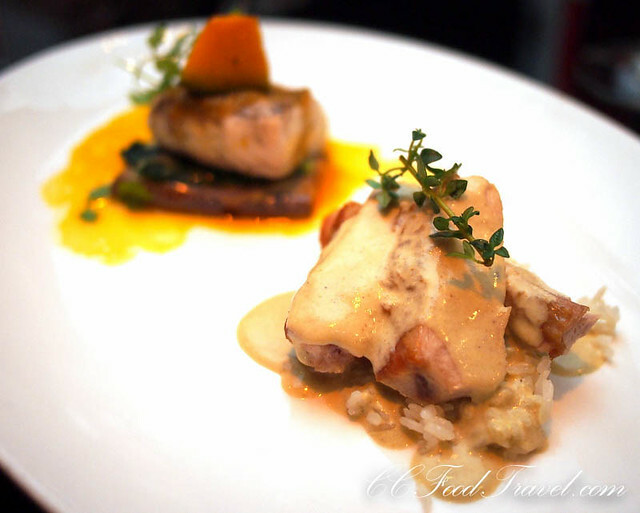 This was a nicely plated mains of two different items – Steamed Fillet of Saltwater Barramundi, Bird’s Eye Chilli, Roasted Baby Eggplant and Pumpkin Sauce and a Pressed chicken saute with grilled asparagus, jasmine rice and lime coconut veloute. This was paired with the Grant Burge Benchmark Chardonnay, Australia 2011. Loved the fish in this main course. The fish was super fresh, firm and well seasoned. The bird’s eye chili elevated the flavors, without being too spicy, as the sweetness of the pumpkin, tones down the chillies effectively. The chicken was not my favorite of the night, being drenched in another rich and strong tasting sauce, but that’s just personal preference. I’d take the fish over the chicken any day. 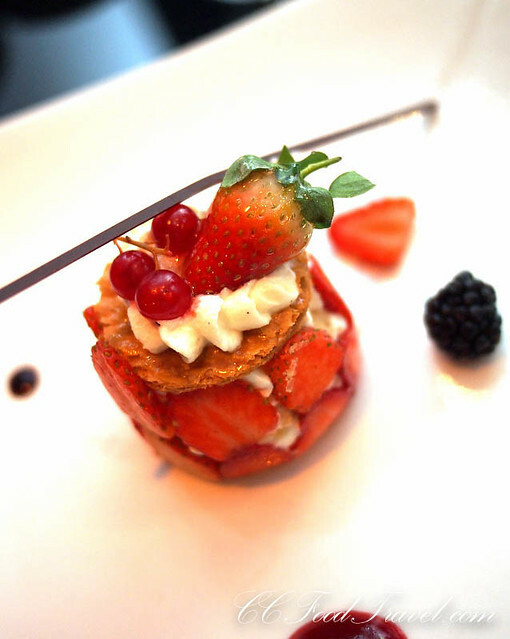 Dessert was the Gariguette Strawberries in a crunchy pastry with light vanilla cream, from Muse Saint Tropez. 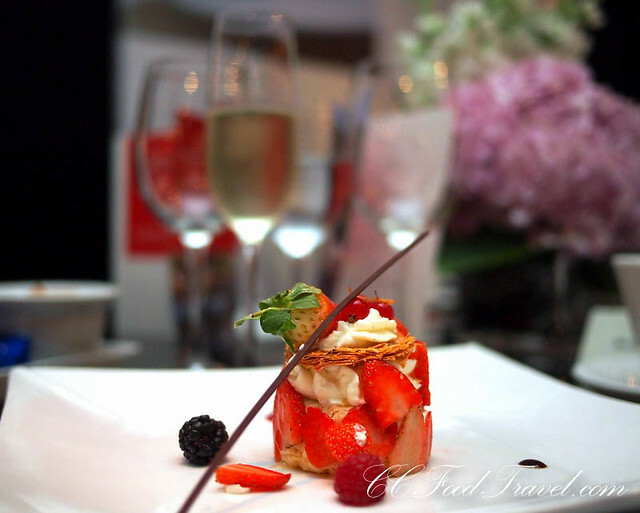 This dessert was heavenly.. first the flaky, buttery crunch of the pastry, then the immediate dissolution of textures into pockets of creamy smoothness.. and finally the explosion of tangy sweet and sour juices of the strawberries. Gariguette Strawberries are tinier but more intensely flavored than regular strawberries. They come from France. 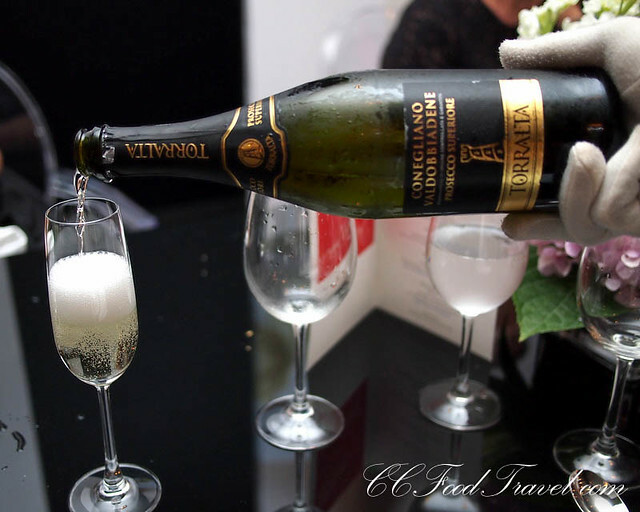 What a superb dessert and paired to perfection with the Torralta Prosecco di Conegliano. Well, that was just a tip of the iceberg on what to expect from the book. If it has peaked your curiosity and you might want to get your hands on a copy of A Perennial Feast, then, you should be happy to know that it is available at Kinokuniya, Borders, MPH Bookstores, Times the Bookshop and WH Smith at the price of RM125 per copy. Previous articleI’ve Reached Nirvana.. at Restoran Sri Nirwana Maju! Next articleDuck or Goose.. 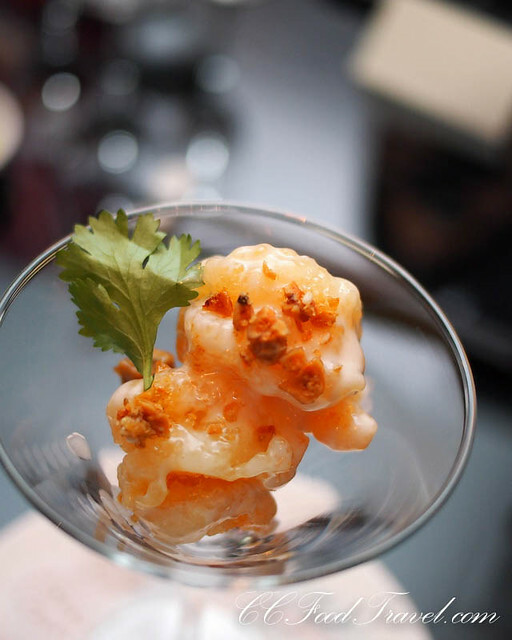 Here are our top 6 restaurants!